By Xah Lee. Date: 2017-07-15 . Last updated: 2017-07-17 . Thumb-shift keyboard (親指シフト oyayubi shifuto) is a keyboard design for inputting Japanese sentences on word processors and computers. It was invented by the team of Fujitsu in the late 1970s and released in 1980 as a feature of the line of Japanese word processors the company sold, named OASYS, to make Japanese input easier, faster and more natural. It is popular among people who input large quantities of Japanese sentences, such as writers, playwrights, lawyers and so on, because of its ease of use and speed. The rights regarding the use of this design were transferred to Nihongo Nyuuryoku Consortium (Japanese Input Consortium), a technology sharing cooperative of interested companies, in 1989. 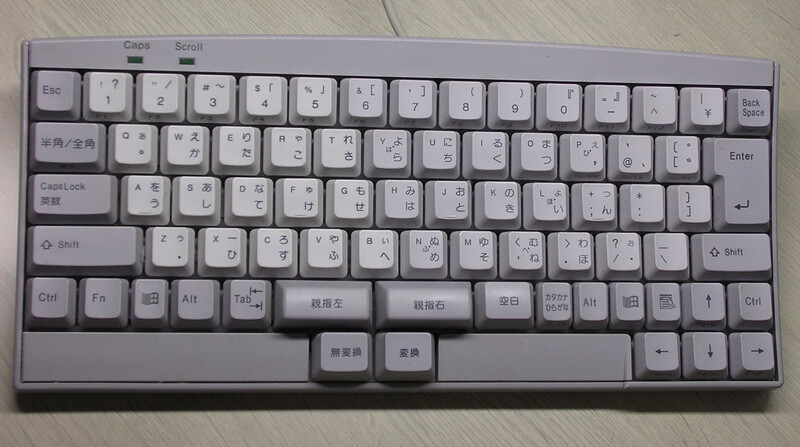 It is referred to as an example of keyboard layout in Japanese Industrial Standards. When word processors for the Japanese language developed in the late 1970s, one of the most difficult tasks was how to input Japanese sentences. Since the Japanese writing system uses three character-sets (hiragana, katakana and kanji), with a large number of individual characters (about 80 for hiragana and katakana, and thousands for kanji), it is not possible to accommodate all these on standard keyboards. Kanji posed the greatest challenge, and developers tried various methods, such as handwriting recognition, large tablet-type input devices, assigning multiple key-codes to each character and so on, but the method called kana-kanji transformation became the primary input method. It works by inputting transliteration, either in kana or by using the Roman alphabet, and the dictionary in the computer changes the input sequences into kanji. The program that accomplishes this task is called an input method editor. There were basically two methods: one is to use Roman alphabet and the other hiragana. In the former (called romaji-kana system), QWERTY is commonly used. In the latter (called JIS kana system), hiragana characters are placed on the keys but since the number of hiragana is large, not only the common character keys but also the top number keys are used. In addition to that, some characters must be input using shift keys, just as the upper case characters in English. Although the abovementioned methods have the advantage of compatibility with widely-available keyboards, there are drawbacks. 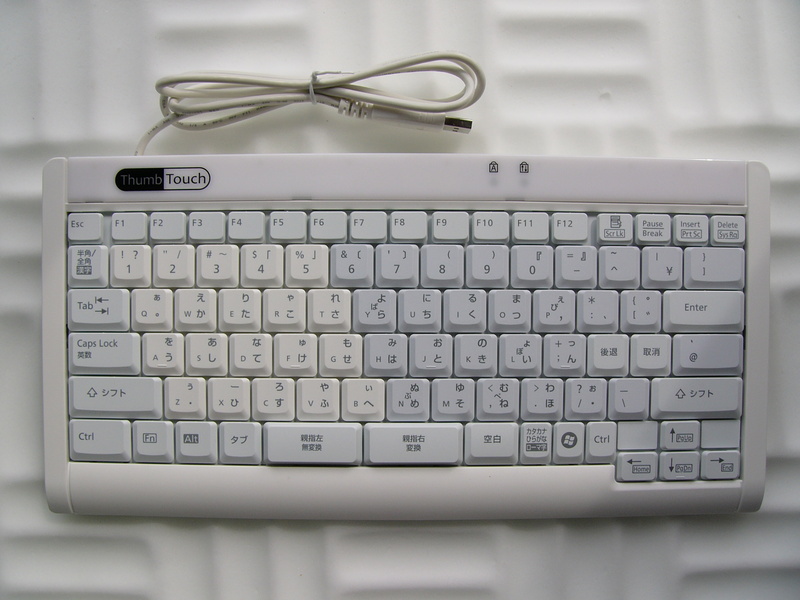 The conventional Japanese keyboard layout is considered by some to be unsuitable for Japanese input. In the JIS kana system, as has been mentioned earlier, some characters are placed far up in the numbers row, making the possibility of typing error higher. The input of numbers is also a problem because some characters share the key positions with numbers. With romaji input methods, the number of keystrokes increases compared to kana input methods, as most kana require at least two keystrokes to input with romaji, compared to a single keystroke for direct kana input. On average, the number of characters required to transliterate Japanese sentences using romaji is roughly 1.7 times that of kana. The engineers at Fujitsu, led by Yasunori Kanda, who were developing Japanese word processors, first tried to use simultaneous hit of multiple character keys to differentiate hiragana characters but they found it difficult to use. They then came up with an idea of using thumb in conjunction with other fingers. Unlike the shift action with little finger in English keyboard, in which shift key is pressed and held while a character key is hit, this method uses simultaneous hit by thumb and other finger. This has several advantages. First, it enables each key to be conjugated in three ways: without thumb action, with the same hand thumb and with the thumb of the opposite hand. This means that the keyboard can accommodate half as much more characters than in the usual method. Second, simultaneous hit with thumb is more natural than the shift action with little finger because of the physiological structure of the human body. Thumbs are much stronger than little fingers. Third, since this was a new concept, it was possible to choose a better layout of characters, taking into account such parameters as frequency of occurrence, sequencing of characters and phonological structure of the Japanese language. a variation of thumb-shift keyboard called NiCOLA. Fujitsu's first Japanese word processor, named OASYS, with thumb-shift keyboard was launched in 1979 and became a big hit. As the line of products expanded, so did the popularity of thumb-shift keyboard. The share of OASYS in the Japanese word processor market reached 20 percent at one time (not all of OASYS were equipped with thumb-shift keyboard, though). But the adoption was slow to spread to other manufacturers' product lines. Although Fujitsu was open to adoption by other manufacturers, there was little incentive for them to adopt their rival's system in the (then) fiercely competitive environment of word processor market. It was only in 1989 when Nihongo Nyuuryoku Consortium (Japanese input consortium) was established with a participation of several companies, including Fujitsu, Sony, Apple Computer, Japan IBM and Panasonic, as the promotion body of thumb-shift. The rights regarding the use of thumb-shift were officially transferred from Fujitsu to the Consortium. It was also a time in which there was a rapid shift from dedicated word processors to personal computers. Although Fujitsu kept producing PCs with a thumb-shift keyboard, including portables, most users preferred ones with an ordinary keyboard and there were very few PC manufacturers which offered thumb-shift. Thus, the growth of PC market did not translate into that of thumb-shift and the share of thumb-shift declined quickly. As of October 2011, three models of thumb-shift keyboard for PC, as well as two portable PCs are on sale. NICOLA is a variation of thumb-shift keyboard. In this keyboard layout, Henkan (“変換”, conversion) is merged with right thumb-shift and Muhenkan (“無変換”, non-conversion) merged with left one because USB HID does not allow additional key left thumb-shift and right thumb-shift .